The 100th anniversary of Mahler’s death is in 2011, but conductors and orchestras are already programming his music at every opportunity - Symphony No. 2 with Jaap van Zweden in Dallas at the end of May, for example; and more recently, Symphony No. 1 with Peter Bay leading the Austin Symphony. Maestro Bay opened the evening’s programme with Blumine, which began its life as part of the Symphony No. 1 until Mahler decided it didn’t belong there after all. At the first three performances of the Symphony No. 1 in the 19th century, Blumine was the second movement. After the performance in Weimar in 1894, Mahler deleted it from the score. In fact, the music had all but vanished into the dustbin of history when musicologist Donald Mitchell found it 72 years later (1966). Conductors then rushed to play and record the newly-discovered Mahler, most often putting it back in the Symphony No. 1. While it is always interesting to hear the first thoughts of great composers, performers also have an obligation to take a composer’s last word as serious and authoritative. Mahler was quite clear about what he wanted to do with the Blumine movement and his intentions certainly didn’t involve putting it back into Symphony No. 1. Blumine, which began life in 1884 as part of the incidental music Mahler wrote for Scheffel’s play Der Trompeter von Säckingen (The Trumpeter of Säckingen), is lovely and interesting music in its own right and deserves occasional performances as a separate piece. Not surprisingly, some of the most notable features of the piece are the extended trumpet solos. Blumine is the only piece of this incidental music that has survived . It is not clear why Mahler took the Blumine movement out of Symphony No. 1. It is a songlike ABA piece of a vaguely pastoral character, but rather slight compared to the other movements. Perhaps he found it too lightweight in a symphonic context. Blumine does, however, have curious symphonic connections - with Brahms rather than Mahler! The first six notes of the trumpet melody in Blumine are identical to those of the famous C major tune in the last movement of Brahms’ Symphony No. 1. Even listeners familiar with both first symphonies can be forgiven for not noticing this connection, since Mahler’s melody has a different rhythm and metre. If I am not mistaken, the Blumine melody is the longest and most elaborate melody Mahler ever wrote for the trumpet – if you exclude the posthorn solo in the Third Symphony - and in this performance it was played beautifully by the Austin Symphony’s principal trumpet, Robert Cannon. 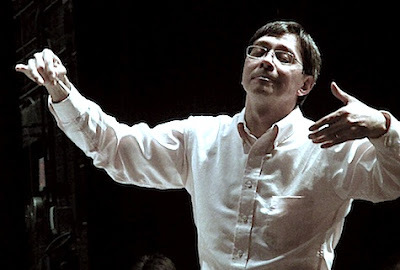 Peter Bay made a wise choice in programming Blumine as a separate piece, on the same programme with the Symphony No. 1. You may well ask why the Blumine movement has a title, whereas the other movements of the symphony do not. In fact, in the original version of Symphony No. 1, Mahler did attach titles to all the movements, including Blumine – or “Flowers” – but later decided to remove them all and send the symphony out into the world purely as music. There are at least a dozen Mozart piano concertos among the greatest creations of the human mind. The musical content is sublime and the interplay between winds and strings is often deeply personal and affecting. Mozart’s last piano concerto, No. 27 in B flat major K. 595, is a wonderful piece although it would not be my favorite Mozart piano concerto. Some others are melodically more memorable, harmonically richer and have more elaborate wind writing. But the winds are still important in No. 27, and conductor Bay and soloist Christopher O’Riley showed that they understood this very well by placing the wind players at the front of the stage where the cellos would normally sit. This meant that they could be heard more easily and could collaborate more effectively with the keyboard. In several of the Mozart piano concertos, the keyboard part seems to be merely sketched rather than fully written out. That is the case with K. 595, especially in the slow movement. Mozart obviously didn’t need to write out all the notes since he was the soloist and would have added his own ornamentation during the performance. O’Riley followed the composer’s example in this respect and added a great deal of his own embellishment. Christopher O’Riley is probably best known to music-lovers as the host of the NPR programme From the Top. It is a programme that introduces extraordinary young talent from all over the United States, and O’Riley has a gift for making these gifted kids feel at ease. He acts as accompanist for many of them as well, and has a busy life outside radio as a soloist in recital and concerto performances. O’Riley has made numerous recordings and on several of them he plays his own transcriptions of songs by the rock group Radiohead. As soloist with the Austin Symphony in Mozart’s K. 595, O’Riley seemed a little nervous. He played all the notes, but seemed to want to vary the tempo more than one would expect in Mozart. It also struck me that the dynamic range of his interpretation was even more limited than the constraints we associate with Classical style. It’s fine to be aware of authentic performance practice, but why use a grand piano and a fairly big orchestra playing on modern instruments if one is going to require that they never be allowed to rise above mezzo forte? Fortunately, by the time they got to the last movement, both orchestra and soloist seemed to be better in sync and O’Riley was beginning to dig into the notes with a little more gusto. Peter Bay demonstrated his affinity for Mahler with an excellent performance of the Resurrection symphony last season. The First Symphony is a much easier piece to play and to comprehend, but it is still far from a simple undertaking, and even celebrated conductors can be caught out of their comfort zone. A case in point was Gustavo Dudamel in his inaugural concert last fall as music director of the Los Angeles Philharmonic. Some of his interpretative choices were questionable, to say the least. He made a big sound, but that is perhaps the least important requirement in a performance of Mahler One. Maestro Bay in Austin had a much less formidable orchestra to work with than the LA Philharmonic, but his careful preparation and respect for the score, together with an enlarged Austin Symphony playing near the top of its game, produced a performance of rare commitment and distinction. Of course, there were a number of horn cacks – with eight of them playing fortissimo and in the highest register of the instrument, that is to be expected in even the best orchestras - but more importantly, there were numerous solos of exquisite beauty. When the Schleswig-Holstein Festival Orchestra (SHFO) played in Austin this season, the double basses were placed on the left side of the stage in the Long Center, whereas the Austin Symphony basses are always positioned on the right side. I was curious to hear if the SHFO setup was an improvement. In fact, I could hardly hear the basses at all in that concert, whereas in the Bay/ASO Mahler First, the basses came through very well indeed. In theory I thought the opposite would be true; we learn something every day. Anyone interested in Mahler’s early years – the time of the First Symphony – will find a wealth of meticulously researched information in Henry-Louis de La Grange's Mahler (New York: Doubleday, 1973). Also very useful is Donald Mitchell’s Gustav Mahler: The Wunderhorn Years (London: Faber and Faber, 1975). There have been dozens of recordings of Mahler’s First Symphony made over the years. Bruno Walter’s 1961 recording with the Columbia Symphony is especially important because Walter was a close friend and protégée of the composer. Among the best of the DVD versions of Mahler’s First Symphony is Leonard Bernstein’s performance with the Vienna Philharmonic. It is Bernstein who is generally credited with starting the Mahler revival in the 1960s. This 1973 performance, however, strikes me today as slapdash. Bernstein rushes ahead for no apparent reason in many places and inexplicably slows the music to a crawl in others. And the Vienna Philharmonic? Remember the horn cacks I alluded to earlier? There are literally dozens of them in this very uneven performance. If I had to choose one recording that combines insight, virtuosity and inspiration beyond nearly all others it would be a 1990 performance by Klaus Tennstedt and the Chicago Symphony, and released by EMI on DVD (EMI Classics 0946 3 67743 98). Tennstedt toiled most of his life behind the Iron Curtain in East Germany. When he finally emerged, the wider world got to know him as one of the great interpreters of Beethoven, Brahms, Bruckner and Mahler. But it was too late. He was struck down by one medical problem after another and ultimately he had to give up conducting altogether. While he had the strength, Tennstedt enriched the lives of those who saw and heard him, not least of all those musicians who had the good fortune to play under him. The 1990 performance alluded to is also important as documentation of the Chicago Symphony in its prime. Two players in particular are by now legendary and deservedly so: principal trumpet Adolph Herseth and principal horn Dale Clevenger.